Mary Sala Butler was one of the first to come to faith in Christ at the Grace Brethren Navajo Mission in Counselor, N.M. She died July 25, 2018, at the age of 75 and services were held for her over the weekend. She was the wife of Tully Butler, pastor of Cedar Hill Church, and mother of Daron Butler, who serves on staff at Grace Church, Wooster, Ohio. Click here to read the beginning of her story. The summer of her sophomore year at Intermountain School in Brigham City, Utah, Mary went home for a visit. To her dismay, she found that her family had arranged a marriage for her. Arranged marriages was a Navajo tradition where young Navajo girls were obligated to fulfill. Tully and Mary Butler were married in 1964. After much prayer and soul searching, Mary took her stand. She would not marry the young Navajo man. First, he was not a follower of Christ. Second, she hardly knew him. Third, she intended to go back to school. Yet the obligation to fulfill the arranged marriage was overwhelming. She appealed to her maternal uncle to intervene. By God’s grace, her uncle intervened and the marriage was called off. Mary returned to school relieved but sad. Mr. James cook noticed her loneliness. After some thought, Mr Cook introduced Mary to another of his bible study assistants, Tully Butler. Tully was a Christ follower and was growing in the Lord. Courtship was virtually unknown in Navajo society. Marriages were arranged by family. In early summer of 1964, Mary returned to the Brethren Navajo Mission as the first Navajo summer missionary. She announced her plans to be married at the mission in August. Mary worked diligently, interpreting and visiting her people to share the Gospel of Christ. Meantime, wedding plans were quickly being arranged. Then on August 1, 1964, Mary walked down the aisle of the little Navajo chapel in the old Mission building. 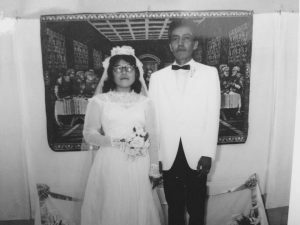 Her uncle, Lee Trujillo, a Navajo pastor escorted her down the aisle. Mary wore a borrowed wedding dress. Reverend Scott Franklin, an ordained Navajo minister, performed the ceremony in the Navajo language explaining how Christ was the center of their relationship and not the Navajo way.